Are You Overwhelmed or Upset With All The Craziness? This message is for those who may be feeling upset, angry, or otherwise overwhelmed by all the craziness in our world and by any of the material on the WantToKnow.info website or our email list. The intention of presenting these materials is not at all to make anyone feel overwhelmed or upset. Our intention is to help people understand what has been hidden from the public by various forces, and to inspire us to join together in building a brighter future for us all. We have no doubt that everyone of us can make a difference in what is happening in our world. There are clear reasons why all of this can be overwhelming. Most of us over the years have developed fairly well-established ideas of how democracy, government, and businesses function in our nation and world. Our educational system and the media generally reinforce beliefs we developed from an early age in the way the world works. It is not easy to open to evidence which seriously challenges these beliefs, even if the information is verifiable and from reliable sources. When presented with information which questions our basic understanding of the world, it's natural to feel uneasy and overwhelmed. Yet we encourage you not to despair. Though it can be overwhelming at times, choosing knowledge and understanding in the long run allows us to work together to build a brighter future. It's only natural that some become upset or angry to discover how much they have been deceived. Many who developed material on WantToKnow.info went through a period of shock and anger upon first learning about the major cover-ups before they eventually shifted to work for change in a positive way. Some individuals may need to go through a period of anger at being deceived. Though it may be important at times to give our anger a voice, in the long run, anger will not change our world for the better, and excessive anger will likely only lead to more of the same. The underlying intention of providing all of these materials is to open you to the possibility that there is much more than you might have imagined going on behind the scenes in the world – both destructive and constructive. There is potential for good and bad in each one of us. When we choose to tap into the potential for good, we each have the ability to make positive changes in our lives and world. As ever increasing numbers of us come together in the intention of positive change – without being in denial of all of the destructive forces – we help to shift the vision of humanity towards a more supportive, cooperative way of life. By opening to understanding the deep difficult parts both within ourselves and out in the world, we can then choose to learn from these challenges. Through tapping into our abundant inner potential, we can collectively transform the difficult places both in our own lives and in the world as we co-create a more caring, supportive way of being and living together. Some of you do not need to go into depth with all of this information, as you feel called in your life to focus on other important matters. We fully support you in this. 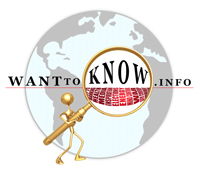 Yet even so, we recommend that you at least take the time to read the two-page summaries of each major category on WantToKnow.info, so that you have a basic understanding of what is happening, and can thus make informed decisions. And don't miss our summaries of all the great reasons for hope and optimism at this link. Others will choose to dive deep into the mountains of reliable information provided and use it powerfully to work towards a brighter future. If you want to understand the deeper levels of all that is going on, we encourage you to find the time to read the 10-page summaries of each major topic at this link and to explore our "even deeper" page available here. Whether you choose to just read the short summaries or to explore our information extensively, we encourage you to read and explore at a pace that is appropriate for you. If you find yourself having a difficult reaction, consider taking a break and possibly enjoying some of the excellent inspirational articles and resources provided at the top and in the left column of every page on WantToKnow.info to keep things in perspective. There are many wonderful things happening in the world which are also being hidden from public view. Our Inspiration Center will introduce you to some of these exciting developments, as will the hope and optimism page previously mentioned. And while exploring the information on cover-ups and corruption, we encourage you to be skeptical. Some of what you read may at first seem quite unbelievable. Do a little research using the reliable sources provided and determine for yourself whether there is truth to the information provided. And we recommend opening to whatever form of spiritual guidance you might have in asking for discrimination, open-mindedness, understanding, and inspiration as you read this material. Many people don't want to know about the major cover-ups going on in our world. Feeling relatively secure and content in their personal lives, they choose to avoid matters which might disturb their contentment. Yet as long as we choose complacency over awareness, these major cover-ups will continue. In fact, they will likely grow in magnitude until people are finally forced to open their eyes and deal with the consequences. The sooner each of us decides that we do want to know, and that we are willing to invite others to open their eyes, the more easily we will be able to build a world that supports the good of all of us. For those who are asking what we can do about all this, there are many ways we can work together to strengthen democracy and build a better world. We most highly recommend a concise, two-page summary of inspiring ideas on how we can build a brighter future at this link. You might also explore our list of concrete suggestions on what you can do at this link. By sharing this information with your friends and colleagues, you can play a key role in restoring a true democracy of the people, by the people, and for the people. Whenever you find yourself slipping into fear or anger with this material, remember that we now have an opportunity to do something about it. Please email your friends and colleagues encouraging them to explore WantToKnow.info and the many links provided. By making good use of the Internet to spread this knowledge around the globe, you can play a vital role in building the critical mass necessary to bring about positive, empowering changes in our lives and in our world. The more we share this information with others, the more chance there is of transforming our world into a safer, healthier place to live. Special Note: For an essay giving more hope and even excitement for our future, click here. And on exploring the material on WantToKnow.info, some people may know or come to understand that one of the main reasons they are here now is to be the change they want to see in the world. If you are one of these people, we invite you to take a look at free, engaging Insight Course at this link.